36" Large Push Nut Roller - Black Walnut Cracker for Serious Nut Crackers! Be ready for nut harvesting season with our Large 36" Push Nut Picker Upper! It may be large but it moves with ease while having three times the ground coverage as our base model. In addition to the extra width, the 36" push nut gatherer has double baskets to increase your nut collection. Saves time and effort all while collecting nuts with ease! 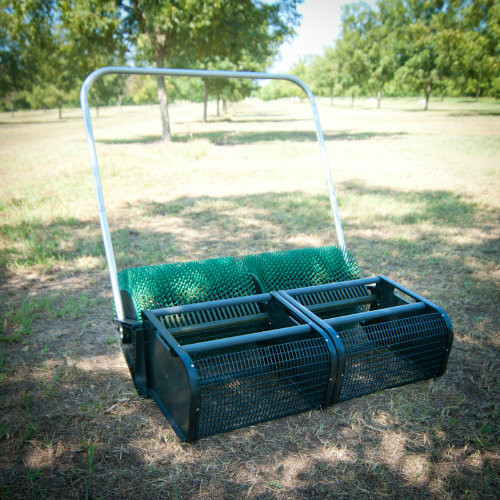 The 36" Push Nut Gatherer is a quality construction piece of equipment built in the US. An effective design that has our customers raving and recommending! Don't break your back picking up nuts this year and don't waste money on ineffective nut rollers. Bag-A-Nut Push Nut Harvester will solve all your nut needs!